As you will know, conversion rate is often used as a KPI to review the effectiveness of Ecommerce sites. Naturally all site managers and owners want to know, "how do our conversion rates compare?" In this post I have compiled different free industry sources focusing on retail Ecommerce conversion, but towards the end of the post, a chart shows average conversion rates for a range of sectors including B2B conversion. When benchmarking conversion rate, we think it's important to explain to marketing managers that they should go beyond headline conversion rates to segment conversion by different types of visitor. To see why, see Dan Barker's excellent post explaining why conversion rate is a horrible measure to focus on. The Monetate Ecommerce Quarterly is a great source giving regularly updated benchmarks on conversion segmented by devices and media for large Ecommerce brands. Rob created the chart below on the latest ecommerce conversion rate data by device from the Q4 2016 data released by monetate in January 2017. With shoppers increasingly using smartphone and tablet to purchase, it's vital for online retailers to know the effectiveness of trading via these platforms. This compilation of retail orders by device type from September 2016 from another source - the Custora Ecommerce Pulse shows the impact of lower conversion rates on smartphone on the level of sales by online channel which is currently 67% desktop and 33% mobile (24% smartphone, 9% tablet). This new report from the Adobe Mobile retail report has a simple table comparing cart and visit (overall) conversion on smartphone vs tablet vs desktop. It shows that visit conversion is nearly 3 times higher on desktop vs smartphone. If you're creating a business case for mobile optimised sites as explained in our Ecommerce mobile and desktop wireframes guide or mobile marketing strategy guide, this data is also valuable since it shows the variation in conversion rate by mobile devices type. Tablet conversion rates are similar, but slightly lower than desktop conversion rates, suggesting people are increasingly comfortable with the experience of buying on tablets. However, it's a different story for Smartphones since these convert at one-third to one-quarter of the rate of traditional or tablet devices. This suggests smartphones are more of browse or research platform rather than a buy platform since many of the large retailers featured in this survey will have mobile optimised sites. Smartphone experiences should be personalised to show this different form of usage. The lower conversion rates for mobile devices are also shown in these compilations of Android vs MacOS vs iOS operating systems, which gives the latest 4th quarter data released in early 2017. These are available in the Adobe Digital Index (ADI) - this data is available in the April 2016 published data for the whole of 2015. The ADI report also compares conversion for EMEA countries against the US. UK and US conversion are significantly lower than other European countries perhaps because of less competition or Amazon being lower in these countries. Different rates of smartphone adoption will also affect this cross-platform average. It's interesting that there is a typical 50% abandonment from basket through checkout to sale, even with the efforts on checkout optimisation. It suggests many will add to basket when researching and comparing, but may eventually buy elsewhere online or offline. This is a screengrab of the Coremetrics data from 2009 which shows that visitor sessions with an add to basket or cart are typically double those of order or sale sessions. The much more recent Monetate earlier in the post also shows this. We have retained this since it shows the increase in conversion if you can encourage a visitor to search. Product category type - conversion rates are much higher for simple commodity products for example - flower purchase (double digit percentage) compared with a higher cost product that will often be purchased in store (for example beds or furniture which will often be less than one percent). Promotion type or seasonal sale - the IMRG data and Coremetrics data below shows that conversion rate can increase dramatically at these times. I'm also often asked about conversion rates in other sectors, particularly for business-to-business lead generation. 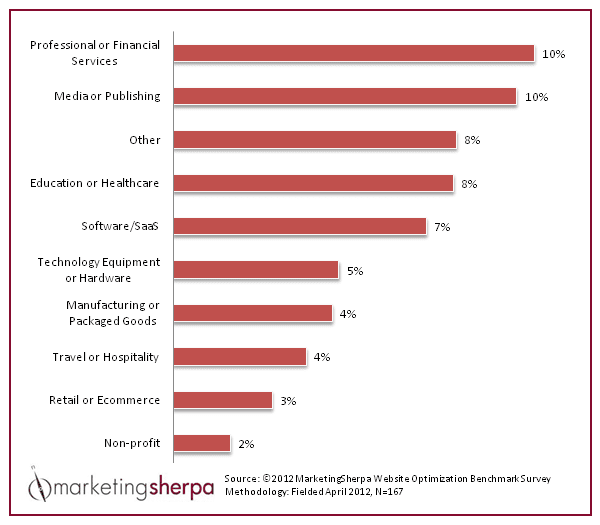 While similar caveats about sub-category, type of visitor and strength of brand apply, this is a useful compilation from this older Marketing Sherpa of average conversion rates by industry sector.